If you need something on the internet, you would probably open your browser, go to Google and enter your search query. You scan through the results and go to the ones that you think are right. There's no rocket science involved here. However, imagine the same scenario for someone with disabilities. Your site maybe be great- with really wonderful content, flashy graphics- and you might boast of a million users- but are you sure that each and every person who uses the internet can access all features of your site? Web Accessibility is the process of making the features of a website equally usable by people of all abilities and disabilities. People use certain accessibility tools to help them navigate the web and these tools have a set of protocols that a web developer must follow to make the product accessible to everyone. In a broad sense, accessibility doesn't just refer to people with disabilities using the web, but perceive, understand and navigate the web without any difficulty. Why do you need to make your site accessible? You may question the need of people with disabilities like poor vision or blindness to even access the internet. However, even though it might be difficult for them, present technology at least assists them in accessing websites. Then again, you may say- let them go to hell! Why should you be concerned about less than 1% of the people who visit your site? Well, for one thing, that attitude can get you in jail! Over a decade ago, in the year 2000, the organizing committee of the Sydney Olympics was successfully sued as they had failed to make their website adequately accessible to blind users. Many countries have since passed laws on web accessibility, making it necessary for you to make your website accessible to users of all abilities and disabilities. What are the different kinds of disabilities? 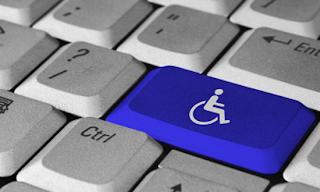 To make your site fully accessible, you must first know about the different types of disabilities that you must tackle. Visual disability is the most obvious one. Blind users use screen readers to read the content on the web. To make sure your content is properly read by screen readers, you must ensure you follow the standards set by W3C and thus make your markup 'Aria compliant'. Another type of disability is the inability of certain people to properly use the mouse. This can either make them surf the web with the help of keyboard alone, and in certain cases, they can just use the mouse, making it difficult to click on elements with precision. Deaf users also use the net, due to which they are not able to hear any sounds being played in the background or in any videos. There are many such categories of disabilities and you would be surprised to know how well they use the web with the advancement in technology. How to make your website accessible? There are a few guidelines that are followed by web developers to make sure their websites are accessible. Users with disabilities usually use assistive technologies like screen readers and specially designed keyboards to help them in perceiving the content on the web. The WAI (Web Accessibility Initiative) under the W3C has developed guidelines to make the web more accessible. To start with, your HTML markup needs to be ARIA compliant to be properly read by screen readers. You need to ensure that every image has a alternate text to be read out by the screen readers. For users with color blindness or low vision, you need to keep the contrast of your website high so that they can distinguish between different colors. Next, you need to ensure that your website can be navigated by keyboard only users. Generally, writing proper HTML markup ensures that. There are certain other things that you must do to help in web accessibility. Providing skip navigation and skip to content links are small examples. Now that you have done your part in making your site accessible, you need to test how successful you have been in your endeavor. The WAI has come up with a list of existing tools maintained by it that can help you test your website's accessibility. They generally check the color contrast, image alt texts, ARIA compliance and the subtle points that I have mentioned above. After reading through everything that I have to say, you might feel that an accessible site usually looks pretty old fashioned, but I would like to contradict you on that one. In my opinion, the best one out there is that of Mozilla (which also happens to be highly accessible)! 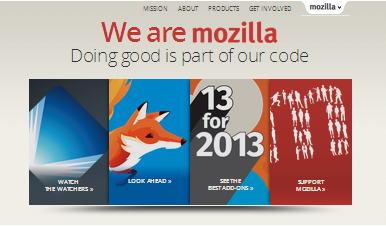 Why do I like the Mozilla? It's simple. For me, the one thing that makes a site stand out in the millions of them out there is web accessibility. This post was a part of the contest- The Elegant World Wide Web organized by The Blog Bowl, sponsored by WebRiti.